An image meant to demean a woman's weight is not only cruel but taken out of context. As is the case with most memes, it is factually flawed. However, it is the premise of the meme — that a person who has access to a cell phone and is overweight can’t possibly be in a desperate situation — that is the most misleading. The identity of the woman in the image is currently unknown to us, but we do know she wasn’t part of the group of November 2018 Honduran caravan members — who as of this writing were housed in a state of limbo at a sports arena in Tijuana, Mexico, as they waited to make their asylum claims in the United States. Instead, the meme used a cropped portion of a picture taken by photographer Victoria Razo for AFP/Getty Images on 2 April 2018 in Matías Romero, a town in the Mexican southern state of Oaxaca. According to the caption, the picture was taken as a group of caravan travelers rested there. It’s unclear from the image alone whether the woman was a migrant traveling with the caravan or merely a resident of the town. It’s also unclear what type of phone she was holding or whether it belonged to her. In the original photograph, the woman can be seen sitting with a larger group of people while a man holds up a blue and white Honduran flag nearby. The assertion that the individual’s physique or cell phone usage undermined potential claims to asylum is a flawed one. Even someone in relatively dire financial straits can often find a way to acquire and use a smartphone inexpensively. Furthermore, landlines in Honduras are limited and cell phones are the primary means of telecommunication in that country, according to the CIA World Factbook. Only five in one hundred Hondurans have landlines, while 91 in 100 have cell phone service. Even when utility isn’t considered, the reason Syrians are using smartphones and not old Nokia 3210s is the same reason that benefits claimants have (gasp!) “flatscreen” TVs … have you tried buying any other kind lately? Budget Android smartphones can be picked up for well under £100, and come with cameras, large screens and everything you would expect from a modern phone. As we’re now in the habit of replacing our phones with a new model every year or two the price of slightly older phones also drops significantly. Furthermore, aside from the flat-out bullying of an anonymous person, there’s no reason to assume anything can be ascertained about the nutritional health of the pictured woman simply by looking at a photograph of her. Being overweight can be one facet of malnutrition, and in fact Honduras and Nicaragua were cited in the 2016 Global Nutrition Report as being Central American countries in which stunted growth under the age of 5, anemia in women of reproductive age, and adult obesity overlap. 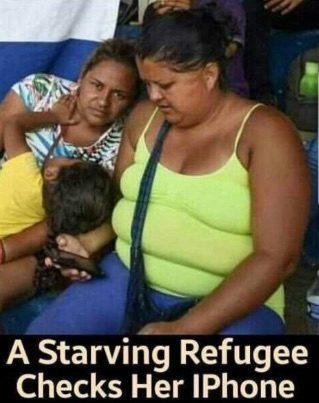 A person’s weight is also irrelevant considering that many Central Americans are fleeing persecution, government violence, and gang warfare in their home countries, not famine or extreme poverty. The migrant caravan that attracted the most attention in the latter part of 2018 originated in the northern Honduran city of San Pedro Sula on 12 October 2018 and traveled on foot through Guatemala and Mexico before many of its members reached the U.S.-Mexico border in late November 2018. The caravan was the target of an onslaught of hoaxes, conspiracy theories and misinformation and was used as a political cudgel in the lead-up to the 6 November 2018 midterm elections in the United States. But as the April 2018 photograph indicates, that caravan was hardly the first of its kind. Caravan members exploded into the news cycle again on 25 November 2018, when photographs of children running away from tear gas fired by Customs and Border Patrol generated public outcry. Predictably, those images drew the attention of purveyors of misinformation who falsely claimed they were staged.